The latest model of the Acer Chromebook 15 was released last year. If you read our review, you'll know it's a solid laptop for the price, even if it occasionally stutters under heavy workloads. The original MSRP for $399 was pretty good, but now you can get a refurbished model for almost half of that - just $224.99. 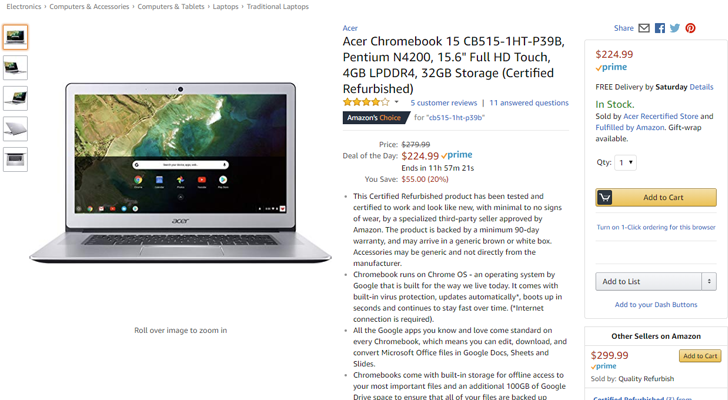 The Chromebook 15 has a 15.6-inch 1920x1080 LCD screen, an Intel Pentium N400 processor, 4GB of RAM, 32GB of eMMC storage, and a 720p webcam. For connectivity, you get two USB Type-C ports, two USB Type-A ports, and a microSD card slot. The whole machine is under four pounds, but has a solid aluminum/plastic body. The refurbs come from Acer itself, and you can buy one from the source link below. As of the time of writing, the sale has 11 hours left.